Neither CNN host Don Lemon nor any of his guests could bring themselves to say the F-word, fascism, in relation to Trump’s latest arch-authoritarian outrage. Too bad. As I have shown across at least twelve commentaries published in the last three years, numerous dreadful strands have intertwined to knit Trumpism into a noxious cloth of creeping 21st century-style and neoliberal-era fascism. One such strand is Trump’s recurrent encouragement of extra-legal political violence against his opponents and critics. But the fact that Sanders calls himself a socialist doesn’t mean he really is one any more than the fact that Trump doesn’t call himself a fascist means the president isn’t a fascist. While Trump wraps his stealth fascism in the flag of American Freedom, Bernie (a social democrat at leftmost) bends over backwards to label his proposals “not radical.” He doesn’t call for workers to seize control of the means of production, distribution, communication, and investment. He doesn’t advocate the dismantlement of the Pentagon System or the nationalization of the leading financial institutions. Fascists stay in power with the help of bourgeois (neo-) “liberals” who inflate the supposedly terrible danger allegedly posed by purported socialism. Listen to the fevered fears of advertising executive and MSNBC commentator Donny Deutsch (net worth $200 million). “I find Donald Trump reprehensible as a human being,” Deutsch recently told MSDNC morning host Joe Scarborough, “but a socialist candidate [Bernie Sanders] is more dangerous to this company, country, as far as the strength and well-being of the country, than Donald Trump. I would vote for Donald Trump, a despicable human being… I will be so distraught to the point that that could even come out of my mouth, if we have a socialist [presidential candidate or president] because that will take our country so down, and we are not Denmark. I love Denmark, but that’s not who we are. And if you love who we are and all the great things that still have to have binders put on the side. 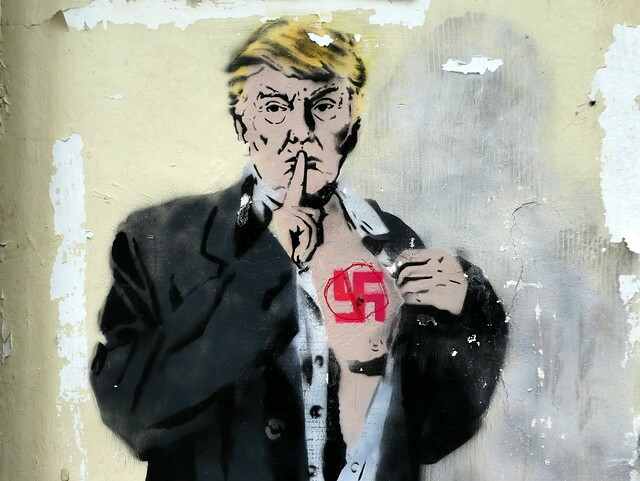 Please step away from the socialism.” The “liberal” Deutsch, who has likened Trump voters (with no small justice) to Nazis, voiced his readiness to vote for the fascist bigot Trump over anyone who tries to make America more like the happy, social-democratic nation Denmark. That’s why MSDNC’s and CNN’s liberal chatterboxes go on and on about how “the Democrats have a socialism problem” but continue to step lightly (more than two years into a creeping fascist presidency!) around the Republicans’ much more real and genuinely threatening fascism problem. A few weeks ago, Cohen tried to tell Congress and the nation that his former boss probably won’t leave the White House without bloodshed. He’s right about that. Fascists don’t generally leave head-of-state positions peaceably. Gird your loins and give to your local blood bank, America: getting rid of Orange DumpsterFire&Fury the nation’s first fascist president is not going to be pretty. See: this (“The Donald Can Happen Here,” Counterpunch, March 11, 2016); this (“Trump’s Shock and Awe Campaign,” Truthdig, 2-3-2017); this (“Orange Thing,” Counterpunch, 10-13-2017); this (“An Insubordinate President,” Truthdig, 11-14-2017); this (“American-Style Totalitarianism in the Age of Trump,” Truthdig, 12-22-2017); this (“Trump’s Durable Base,” Counterpunch, 2-2-2018); this (“The Madness of King Don,” Counterpunch, 2-16-2018); this (“Creeping Fascism No Problem for Trump’s Durable Base,” Truthdig, 9-5-2018, including an in-depth examination of the leading social science data on the fascist Trump base); this (“‘Male Energy,’ Authoritarian Whiteness, and Creeping Fascism in the Age of Trump,” Counterpunch, 10-19-2018); this (“Trump’s Endless Mendacity and the Dawn of American Fascism,” Truthdig,10-31-2018, with special emphasis on the assault on truth); this (“Signs of Creeping Fascism are All Around Us,” Truthdig,11-14-2018); this (“Barack von Obamenburg and How Fascism Happens,” Counterpunch, 11-16-2018,); this (“Bordering on Fascism,” Counterpunch, 1-11-2019); and this (“Cohen’s Overlooked Warning,” Counterpunch, 3-1-2019). This entry was posted in Capitalism, Democrats, Fascism, Media, Politics, Racism, Socialism and tagged Bernie Sanders, Donald Trump, Nationalism, Paul Street, Same As It Ever Was, White Nationalists, White Supremacy. Bookmark the permalink.